It has been so fortunate that I have gone to many countries and many cities through my music making, and I have met so many wonderful people. That is my treasure! Most of South and Central America, France, Tokyo, Osaka, from West to East Coasts in USA, Hong Kong, India… My musical journey has taken me to so many places in the world. And I continue expanding my destinations and concert repertoire! Please check my concert schedule! Besides performing I occasionally adjudicate competitions and give masterclasses. 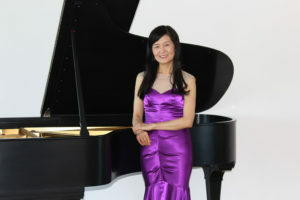 I coordinate the monthly concert series “3rd@1st” in Los Angeles, and this October it will make the 5th season. I am very proud of this series! I am humbled by many dedicated donors and volunteers. Also I am a chapter president of the teachers’ organization (MTNA), and I enjoy working to offer great programs for students. Our chapter has excellent teachers too! Being an experienced bookworm (!) I write book reviews often. I love movies! I love cooking too! So my blogs and photos on this website cover so many different topics and scenes. Most importantly (!) I am a founder of Los Angeles Sumo Fan Club. I enjoy sharing my Sumo passion with friends at the Japanese Izakaya. Thank you very much for visiting my website!! Have a Wonderful Fall!